If there’s any home decor accent that can be truly called stunning that’s a DIY mosaic. No matter how simple a mosaic is, it always looks intricate and exquisite. It doesn’t matter if it’s a table top, floor tiling, wall art, if it’s made of broken ceramics, stained glass or pebbles – it will always have that luxe appeal. Making mosaic craft projects does’t have to be complicated either. Sure, a colorful tabletop pattern looks like it takes ages to make, but it’s not that difficult if you have a plan to follow. And the best thing about it is that someone has done it before, and they can tell you how. 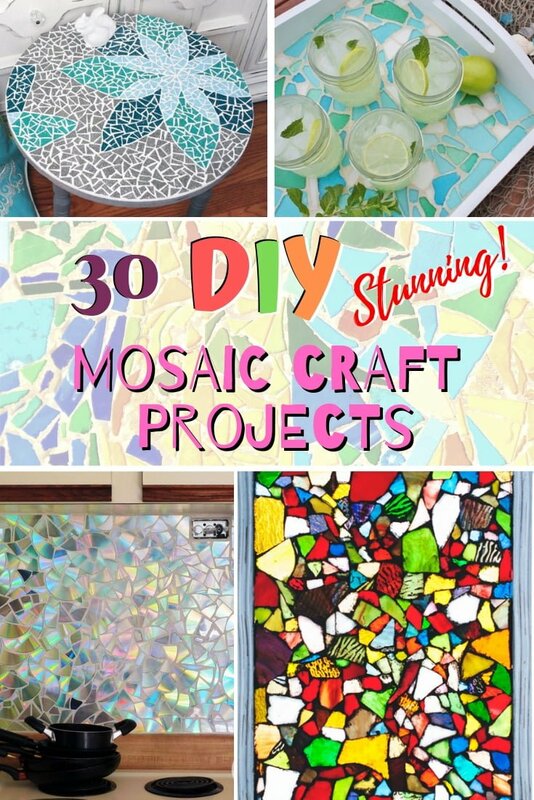 On that note, here are 30 really impressive mosaic tutorials that you can use to create stunning decor at your own home. Use colored glass tiles to create this beautiful tabletop mosaic by following a pattern. Such an accent piece of furniture is perfect as a side or end table in the living room. If you’re not up to spending some time arranging small bits of mosaic, simply use decorative tiles. This is a great IKEA hack to transform a simple table. 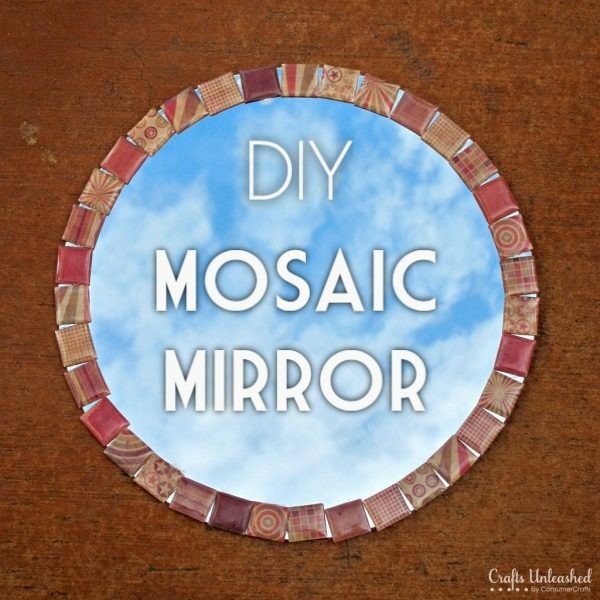 You can also use CD shards to create a beautiful mosaic DIY mirror frame. It’s simple but definitely adds a lot of decor interest. A decorative tray is a sure way to create a gorgeous vignette especially if it has mosaic detail. 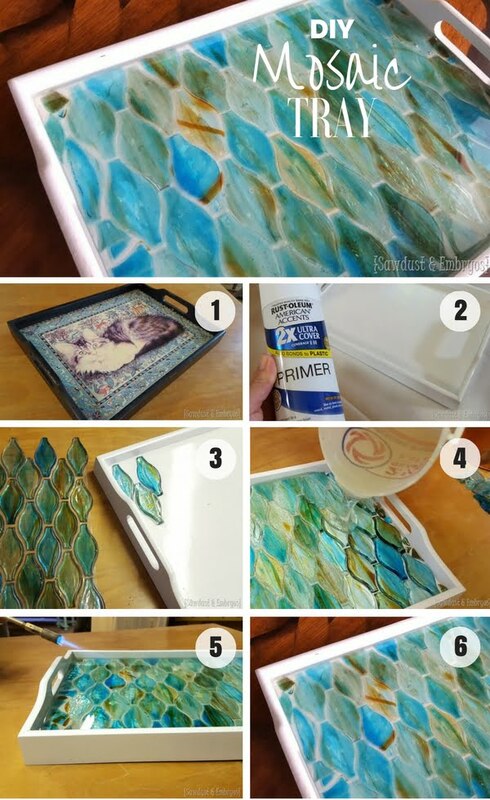 You can easily make such a tray if you have some leftover kitchen backsplash (or other) tile. These luminaries create awesome ambient lighting and just a little bit glamour in your decor. Create these jars with glass gems in any color combination and mosaic you like. These cocktail coasters are brilliant not only because they make nice mosaics, they work great in catching those spills. So make a few for your home as well. Tile a table in mosaic tile to get a great outdoor table. And while this plan is for your porch or backyard, you might as well use the same idea for an indoor table too. This has to be one of the most astonishing handcrafts using waste materials ever. Use a Pringles tube, pebbles and adhesive to create this whimsical rock vase. For some beach inspired decor style use sea glass to decorate a tray. You can find sea glass in different color in craft supply shops and online. You can use mason jars or just plain old jars (preferably stained glass) to make a gorgeous DIY kitchen backsplash. Just brake them and use the shards to create a beautiful mosaic. Another idea for a small yet high impact decor accent – a mosaic key storage rack. Basically it’s a small piece of wall art with an added storage function. Great for entryways. Here’s just another mason jar craft project but really beautiful one at that. 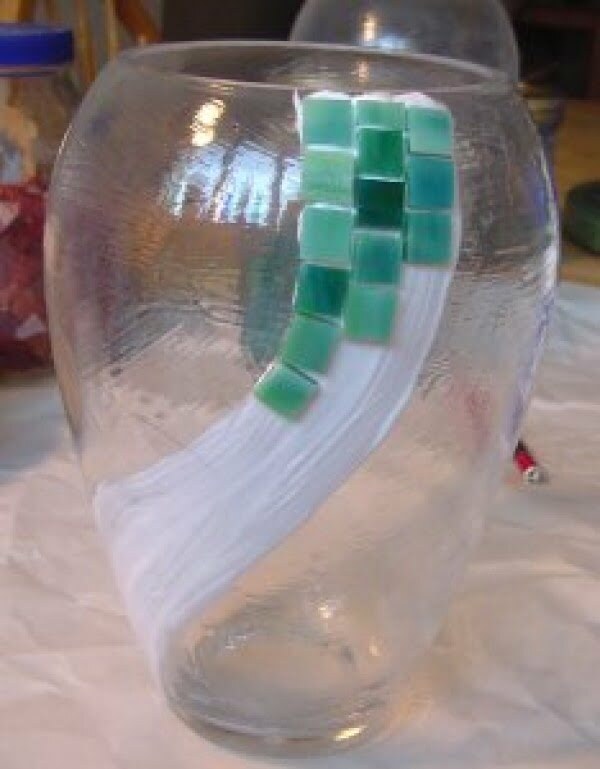 Create this simple sea glass mosaic jar and you can use it as a candle holder for great ambient lighting. If you want your home decor to be impressive from the first look, your front door is where you have to start decorating. A mosaic address marker is interesting if a bit whimsical decor accent that you can easily make yourself. What you need for this craft project are some stained glass tiles and a vase to stick them to with adhesive. It’s a really attractive decor accessory to make for your home. If you want more whimsical or even quirky wall art and decor accents at home, try making these beautiful mosaic panels. Use tiles, glass or ceramic for the material – it’s totally up to you. And here’s another clever use for mosaic tiles – a bathroom mirror frame. It’s definitely a decor accent with a lot of interest and visual appeal. This is a really attractive mirror frame that can easily become the focal point of the entire room decor. Use any kind of ceramic or glass pieces to glue the mosaic pattern together. 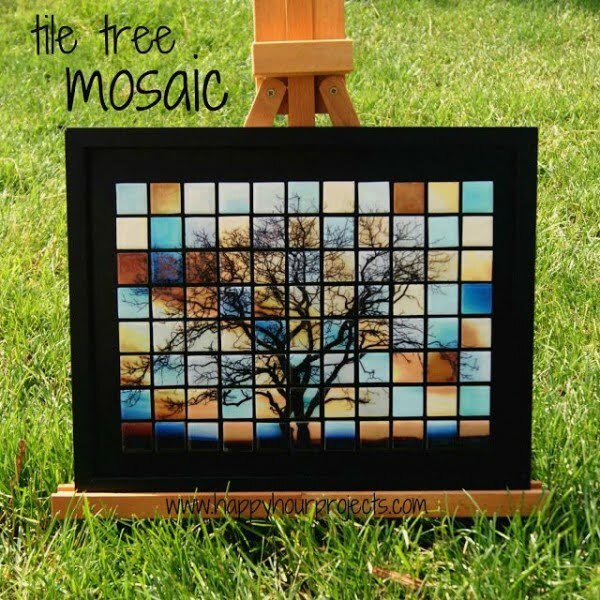 This DIY mosaic craft is a perfect choice when looking for that stained glass look for the windows but can’t find the right ones. 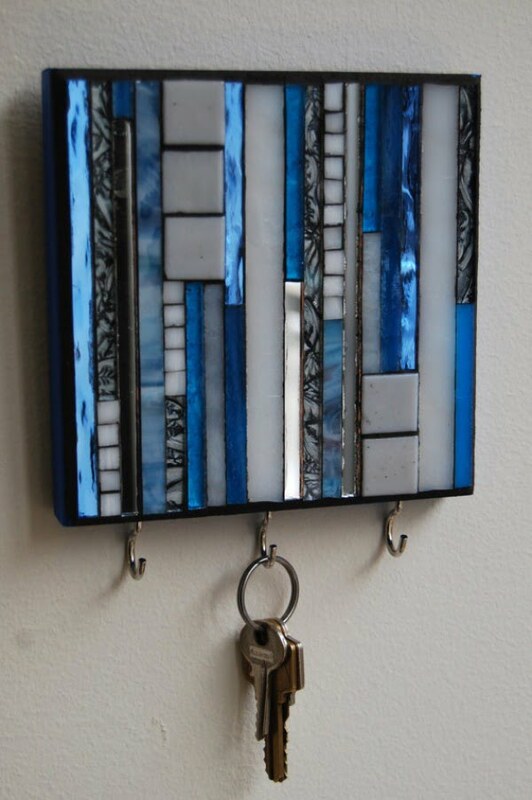 It takes differently colored mosaic glass pieces and some glue to create these picture frames, which can be hung on the windows to bring colored light. The reflective surfaces of CDs make this beautiful backsplash that turns a plain kitchen into a vibrant space. For the best results, the design requires CDs without scratches. Besides creating a simple backsplash that blends with contemporary interior décor, the recycling of CDs is environmentally friendly. 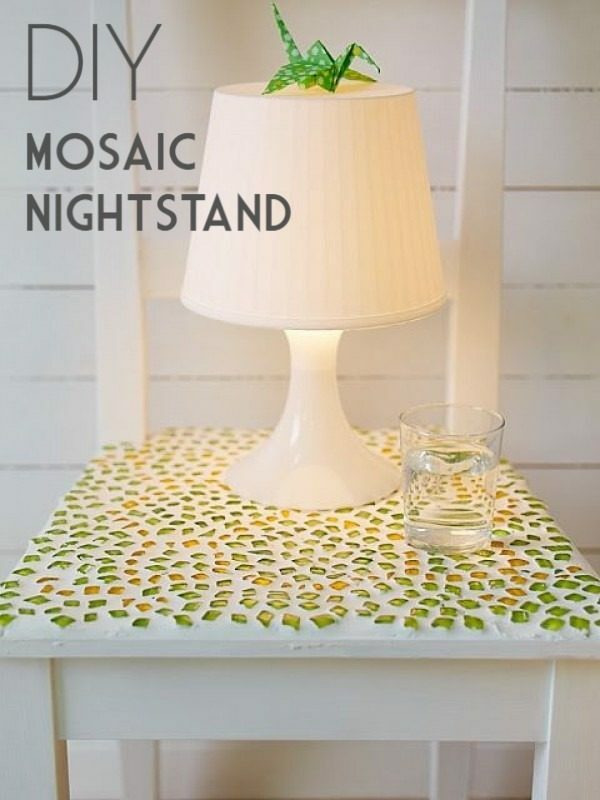 Another DIY mosaic craft to pull off with CD is a tabletop. 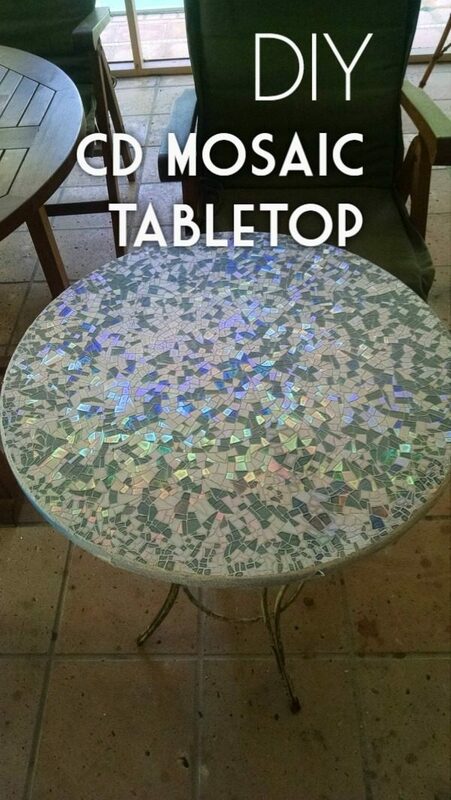 By breakage off CDs into small pieces of different shapes, a DIYer can get a stylish countertop for an old table that bounces off colored light beams. The mosaic tabletop can go indoors or outdoors, depending on a homeowner’s décor needs. Using different types of CDs gives the best look. A nightstand can make just as much a statement as any other piece, and this project is one way to achieve it. Colored beads and white paint result in an elegant look that can be incorporated into any theme from country to contemporary to minimalism. 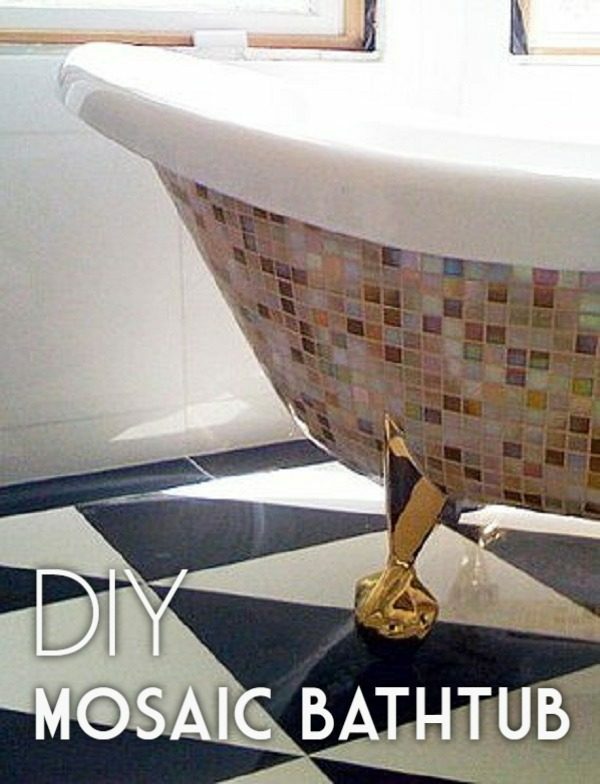 A fun idea to try out for the bathroom is this mosaic look for a clawfoot bathtub. With the right mosaic glass tiles, a homeowner can pretty up a clawfoot bathtub to get rid of the monotony of ceramic. 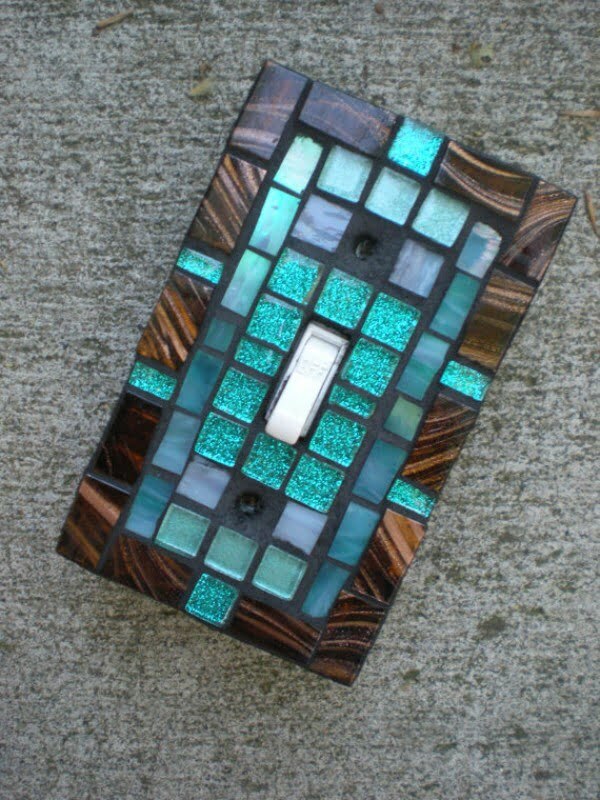 The thing about multicolored mosaic glass is that it matches any color. On the same note, consider a pretty bathtub tray to go together with your new tub. For anyone looking to add a bit of pomp on the mirror, this DIY mosaic craft is the perfect one. Instead of mosaic glass pieces that have to be fitted with glue, this craft uses self-adhesive mosaic tiles, which means there is no messing up the mirror itself. This mosaic piece will brighten up a room when hanging on the wall or leaning on the mantelpiece. The picture used for the artwork can be anything other than a tree, giving a homeowner numerous options when furnishing the living room. During the summer or winter when a drink is always welcome at any time of day, this mosaic mini-tray is a must-have. It is small enough to carry easily to the patio or the bedroom, and it does not occupy a lot of space. The project only takes a few minutes, so one can get several mini trays for the house. 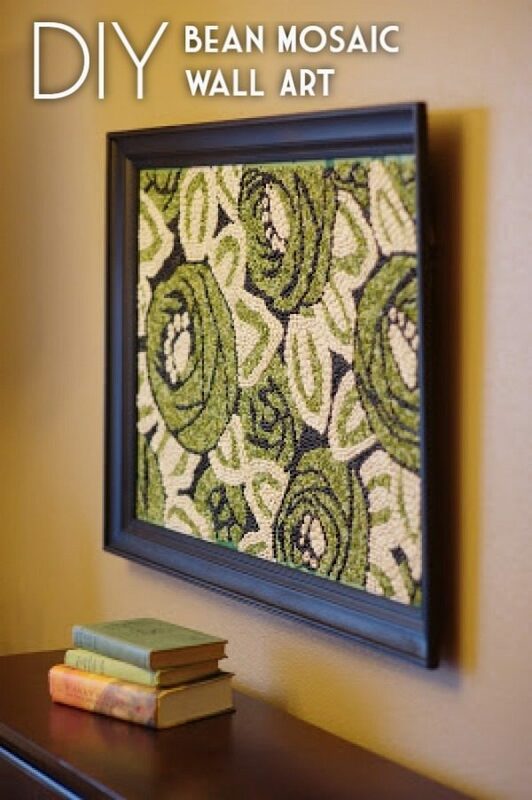 This creative mosaic project uses beans to come up with a nice floral arrangement that can fit in any part of the home. One can use any other legumes for a personalized accent piece. 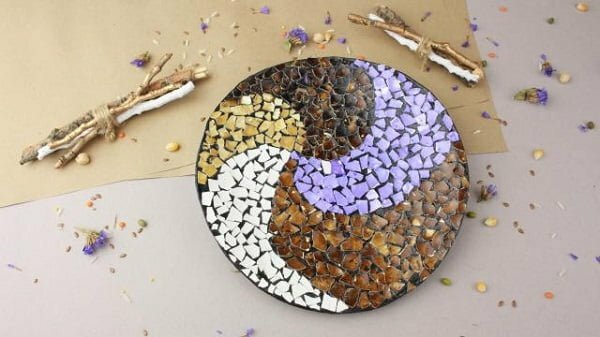 The simplicity of this DIY mosaic craft makes it suitable for anyone. Eggshell mosaic is a classic, and this craft captures that beautifully. The use of colored eggshells makes the decorated plate a versatile piece that can fit anywhere from the bathroom to the bedroom to the living area. A DIYer can come up with various patterns for the eggshell mosaic for that unique elegance. For that subtly eccentric look in the living room, this clay letter accentuated with glass mosaic tiles is the ideal addition. The attention-grabbing piece can be displayed on a bookcase or mantelpiece. With all the letters and numbers available, the décor options are limitless. A tile mirror is a simple way to add life to bare bedroom or bathroom walls. 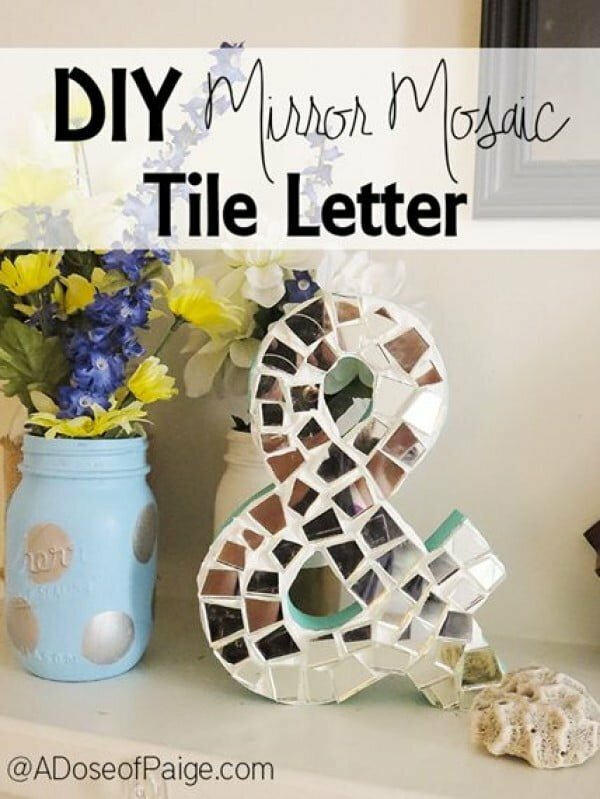 This DIY mosaic craft can complement any interior décor, depending on the glass tiles used on the edges. A customized mirror is also a great piece to add to party décor.